Thank you for choosing Centennial Park Golf Course to hold your golf outing or tournament! We welcome you and your players, and promise to make your event an enjoyable and successful experience. We are always accepting Golf Outings & Tournaments inquiries! We pride ourselves on offering Munster's friendliest service to all of our customers, and providing the best golf course layout and conditions for all skill-level golfers. Your group's players will experience the best that Centennial Park has to offer. Please complete the request form at the bottom of the page for more information so that we may personally attend to your group's specific needs. We look forward to speaking with you soon! Along with putting on a flawless outing, Centennial Park host a variety of outing reception venues and food & Beverage Packages to make your outing complete. 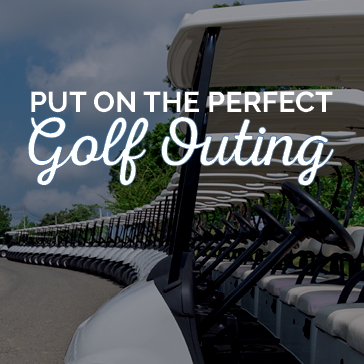 Our staff is happy to work with you to customize a menu to fit your outing needs. The banquet room offers floor to ceiling views of Lake Maynard and is perfect for large outings. The banquet room can accommodate up to 210 people. The smaller Salons can accommodate up to 60 people. Located inside the clubhouse, "The View" Restaurant, is a beautiful, modern room, overlooking Maynard Lake. We offer a casual, family-friendly dining experience. We offer selections including bunker burgers, assorted hot and cold sandwiches, specialty salads, gourmet soups, delicious daily specials and desserts as well as kids' meal choices. Fountain drinks and beverages are also served. A favorite among golfers! Perfect for small to medium size outings, the outdoor patio deck overlooks Lake Maynard. The deck include umbrellas and shady areas for you to enjoy a post outing meal, or to grab a drink after your round.